Even 3 year olds know this. This entry was written by Chennette and posted on January 19, 2009 at 4:52 pm and filed under Chennette, family, life. Bookmark the permalink. Follow any comments here with the RSS feed for this post. Post a comment or leave a trackback: Trackback URL. Another chocolate fiend in your family, huh? it’s the child. too many lawyers in her family. LOL I just had some Lindt myself. Hope you are well and happy new year. Ive been really busy with housebuilding etc. I am one of the few people left in the world who could refuse chocolate and ice cream. 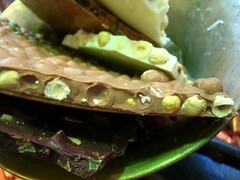 It’s strange that I also blogged about chocolate yesterday. I was inspired not by a child but by the BBC Health Watch broadcast. Niece #1 was also responsible for sneaking the first taste to her brother when he was just a few months old by letting him lick her messy chocolate fingers before anyone knew what she was doing. Yes, chocolate is too good…even children know this btw, are feeling better from ur post-hajj illness? I’m having a hard time subscribing to your feed. Can u assist me please? When I click the subscribe link it takes me to an html-looking page. From the mouths of babes… Truth! Nice blog. I see you live in Guyana. You ever heard or read anything by Guyana Gyal? I am shocked. Well, unless generous means she gave you one at a time 😀 she’s growing up! what?? what were you bribing her with??? generous?? you think 3 chips is generous??? your niece is very rational. and she is right.